Kaala Chashma singer Neha Kakkar is one of top A-lister Bollywood singer. Being a celebrity sure has its own advantages as you receive loads of love and fame. But there is always another side to the coin where you are not at the good end of receiving drawbacks. 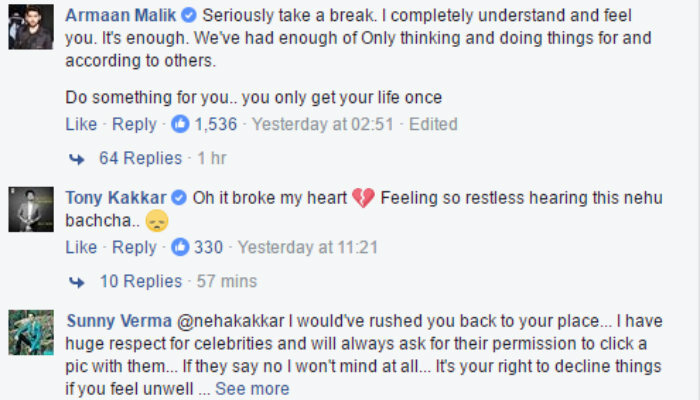 Neha Kakkar is such one celebrity who recently victimized at one of her recent performance at a wedding. 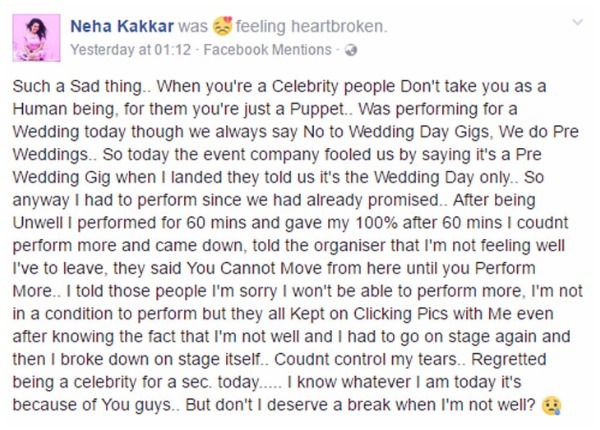 Neha took her FB account and penned down her bitter experience she had come across during one of her stage performance. Horrified Neha, who was unwell had to perform at a wedding regardless of not being well and was demanded to continue her singing. She broke in tears. Neha’s post on Facebook received loads of love and condolence from her fan followers. When will people understand that celebrities too are human being and can fall sick as we do.